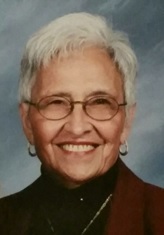 Florence A. DeBellis, 84 of Leavenworth Ave., Auburn, N.Y. passed peacefully to her eternal reward on Sunday Oct. 14, 2018 in Richmond, Va. due to natural causes. Florence’s original name was “Fortunata” meaning fortunate or blessed in Italian. Florence was blessed in many ways and she bestowed blessings upon all who entered her life and her home. Florence was born on Sept. 1, 1934 in Auburn and was one of 4 children of Gennaro and Anna (Charella) Vanacore. She grew up in the “West” end of Auburn with her two older siblings, Pasquale (Pat), Frankie, and her one younger sister, Patricia during a time when family and traditions were the backbone of society. After graduating from West High, Florence went to work at Firth Carpet to help her family. She developed friendships from her early days that would last her entire life. Florence’s friendship with her friends, Philomena (Fantasia) Matro, Camille (Lobisco) Fornesi, Lucy (Pulvere) Gentile and Judy (Morabito) McGinn would continue until Flo’s last days. One of Florence’s dearest and closest friends was her cousin Caroline DeMaio and her family. Florence met her husband Peter and on August 4, 1956 were married and began a life together. She began her family in the old neighborhood off of West St. in the Italian section of town. In the late 50’s Peter and Flo had their first two children, William Gennaro, and Peter Michael born only a year and a week apart. Like most ethnic families at that time, the relatives often helped in bringing up the children. Florence’s parents were just down the road and their doors were always open. Peter’s mother, Carmella (Petrosino) DeBellis, lived just above the new family. Two years later another joy was brought into the family. Florence gave birth to Mary Ann on Oct. 14, 1960 and when mother and daughter came home on Peter’s birthday, Oct. 19; Flo said, “here is your birthday present, try to top this one.” Peter often told this story because of his love of his wife and daughter. Then a few years later Flo and Peter were fortunate and blessed with their second daughter, Patricia Marie. Not to be outdone by her older sister, Flo brought Patricia home on Father’s Day 1963 just a few days after her birth. Flo said here is your Father’s Day gift, now you have been doubly blessed. Peter and Flo moved to Leavenworth Ave. and helped build their new home for their expanding family. Coincidently, now their children mirrored Flo’s own siblings; 2 older boys and 2 younger girls. Their home was a refuge for all children of the neighborhood, their door was always open. Flo was often cooking upstairs while Carmella was baking downstairs. Flo was famous for her Italian dishes and baking her Italian Christmas and Easter cookies, (Wandies, Frits, Gingeland, Birdnests, Easter pizza, Cobbler and many more) many of these difficult pastries were made with her sister, Patty Lewandowski and her cousin Caroline DeMaio. Florence was often the one who would make the dishes and invite people to stay for dinner. Her simple Italian meals were learned mostly from her father, Gennaro, because her mother’s early death at 54. Flo’s recipes were famous and some were even published in local cookbooks. Florence’s home was busy night and day with visitors; whether coming over on Saturday to test the fried meatballs or Sunday for a quick plate of ziti visitors were often found in the kitchen “sampling” even when no one was home. Florence worked at General Electric and then worked as a switch-board operator for Auburn Memorial Hospital. Flo and Peter worked several jobs to put their family through school and their love for their children was unequaled. One of Florence’s greatest gift was her quiet faith. This was evident in the numerous times she would bring the family to Lenten services and pray the rosary together. Flo would often fall asleep saying her rosary for her children. Her children were brought up with love and taught to love their friends, their family and their faith. This was taught to them by their parents Peter and Flo, and their grandparents, many whom lived with them passing on the faith and traditions of their Italian heritage. Florence is predeceased by her husband of 57 years, Peter K. “Labanski” DeBellis. Florence is survived by her four children, William Gennaro DeBellis; Rev. Peter Michael DeBellis; Mary Ann (Dennis) Cullender of Richmond, Va.; Patricia Marie (Gerard) Daly of Richmond, Va.; her brothers Pat Vanacore of Auburn, N.Y. and Frank Vanacore of Auburn, N.Y.; her sister Patricia Lewandowski of Auburn, N.Y. Florence’s twin great-aunts, Rose Zema and Camille Picaro, of Auburn, N.Y. Florence has 8 great-grandchildren, 6 grandchildren, and numerous nieces and nephews. Florence, Fortunata, DeBellis will be remembered in our hearts and our homes because she blessed us by her love of our Catholic faith and family and taught us to be a blessing for others. Italians do not say good-bye, they simply say “ci vediamo.” Now we say “ci vediamo” until we see each other again dearest mother in our eternal reward.